Between the 28th and the 30th of September 2011 the “GREEN CAR GLOBAL VENTURE FORUM” took place in Kimdaejung Convention Center over Gwangju (the sixth biggest metropolitan city in Korea) placed in South of Korea. Automotive Space was sitting there as spectator too! First staged in 2010, this event is the largest auto show relevant to Green Car in Korea. The intended mission is to gather automotive industries at the international context bringing great attention, support and participation of several companies from home and abroad. Despite of the good initiative, the overall impression and perception we got from the exhibition was sometime closer to a sort of Portobello’s Road venue than an intended international EV Motor Show, where everything is usually led swiftly and smoothly. The reason of the above statement is mainly due to the fact that all the main actors were coming from the Asian Market (we did not see any representative from Europe and America except for some potential buyers purposely invited) and part of the exhibition was well oriented to commercial deals in procurement of electric parts that usually are commonly used in the current vehicle productions made of tradition endothermic engines. Bit even disappointed about the size dedicated to the event: too small and unsuitable to transmit a warm feeling and an atmosphere about this particular innovative event that should drive forward this Automotive Market Niche. In any case it was quite interesting to see some interesting engineering solutions regarding interiors applications (i.e. new concept of car cross beams, noise insulation parts, readapted central consoles, etc. ), weight reduction materials, and electric engines of course (i.e. traditional applications and/or individual wheel traction applications). 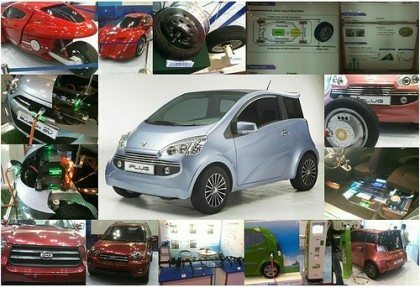 Particularly it has been quite amazing to see the challenging development of an EV vehicle carried out by GNDwintech Co., Ltd, which is due to be launched in production in 2012 at a very competitive selling price. This Company is a Korea-based organization that specializes in the home electric appliance area. Its products consist of remote controllers for household appliances such as televisions (TVs), video cassette recorders (VCRs) and others; controllers, which are mainly used in air conditioners, and control boxes. It also provides electronic components and materials. The Organization mainly distributes its products to SAMSUNG ELECTRONICS CO,.LTD. Most important GNDwintech Co., Ltd. completed the merger with TOP Research Development, on November 16, 2010. Through the merger, the Corporation is also engaged in the development and manufacturing of electric cars. As you can see in the above picture the vehicle (named iPlug) is closer to a proper City Electric Car for urban modern people designed and equipped with all the decent comforts and infotainment features. 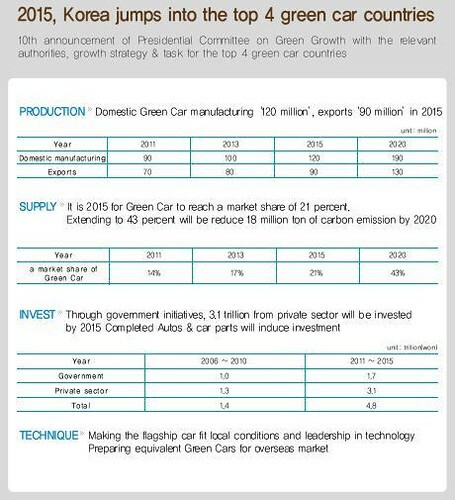 Lastly but not less important, it has been quite interesting to go through the strategic plan for the next further coming years in which the Presidential Committee on Green Growth express its confidence about an exponential development of this niche Automotive business (as per the following table officially introduced during the event). In 2020 we will definitely see if they have been right to be so optimistic and ambitious. Oh! By the way! 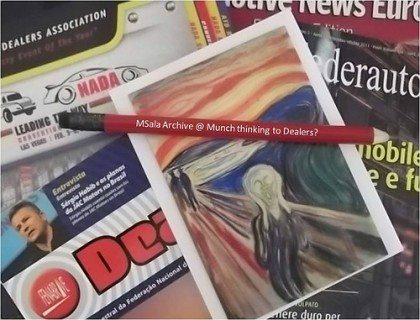 Do not forget to pencil in your Agenda the next follow up EV event in May 2012 from the 6th to the 9thover Los Angeles Convention Center in USA.